Making your own outfit or rave costume is a lot of fun but it can be really time intensive. Sometimes you just need something quick and easy that'll make you look amazing. We carry a great selection of complete costumes that will have you looking great on the dance floor no matter what time of the year it is. 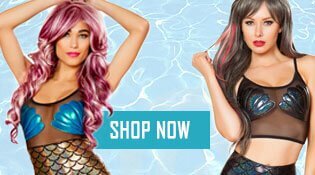 Whether you're looking for a transformative Halloween rave costume or maybe something extra intense for Electric Daisy Carnival we have you covered. With thousands of products from the most respected brands we're help you feel your best on the dance floor. Rave Costumes There are 26 products.